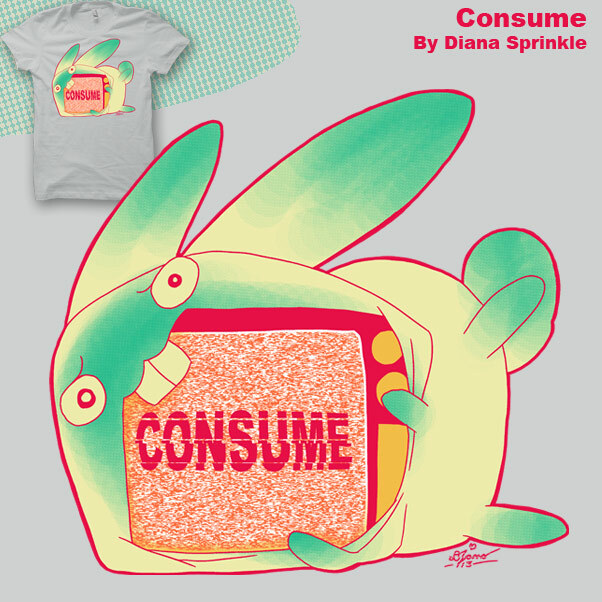 Television is always telling us to consume things! 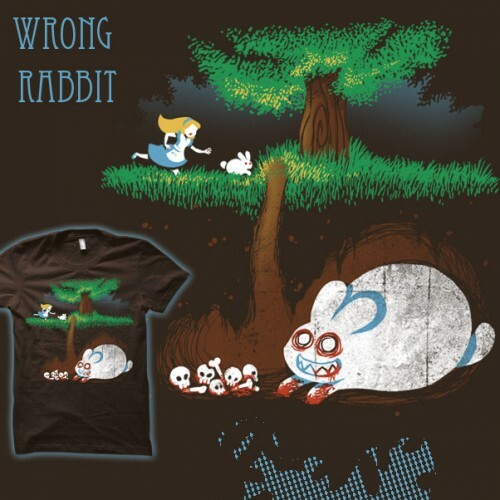 This bunny has the wrong idea on what that means… or maybe it’s the right idea? Nom nom nom… Woooo! I actually made this shirt on time the night before, that’s like a record for me. New design for Shirt.Woot’s “Television” derby t-shirt design contest. Give me a vote if you can by following the link in the image above. I’m trying out some different more odd color schemes and inking… I think I’ll need to mess with it a little more and see what happens. Filed under Animals, Art, Original Art |	Comments Off on Consume! New shirt design for Shirt.Woot’s 300th derby! Stand out, stand out, with the ugliest tux around. Tuxedo cats, they are the cutest! Look how smug that one in the center is! Please give me a vote if you can, they are printing the top 7 shirts this time! So your vote will really count. 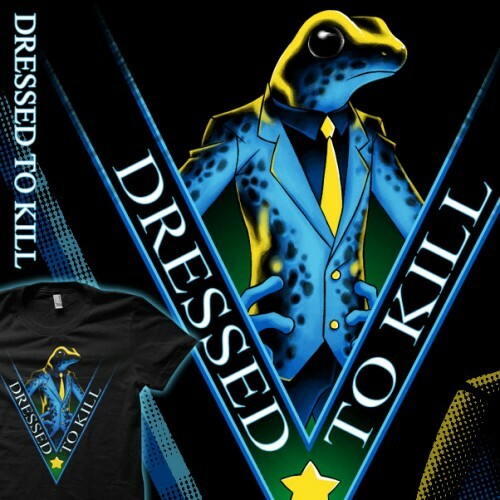 Even though you’re deadly there’s no reason not to look great while you poison things. 14 Karat Gold shirt on sale! YAY! So my shirt from the “Gold” derby failed to place in the Double Take derby or get picked as an Editor’s Choice shirt BUT it was picked to be a part of Shirt.woot’s side sale “Mentions of Honor”! It’s going to be on sale until 11:50 PM on Sunday the 23rd! 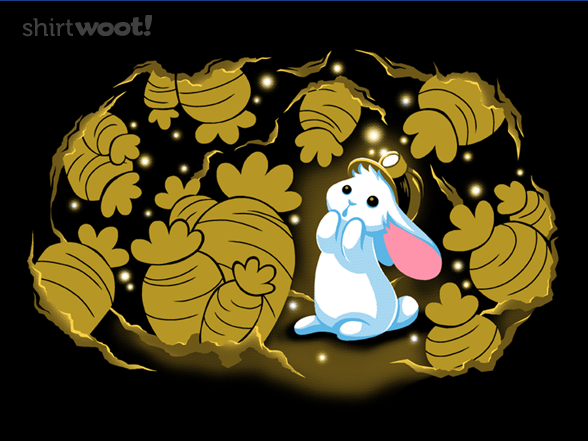 I’m really looking forward to seeing this shirt print since the gold color of the carrots is going to be printed in metallic gold. It’ll look awesome! Makes excited noises! Oh check the size chart link at the bottom of the page before you order! Woot changed their shirt blanks earlier in the year and the woman’s sizes are not so tiny anymore (the men’s blanks are about the same)… it’s a sad day though for people that fit into tiny shirts. 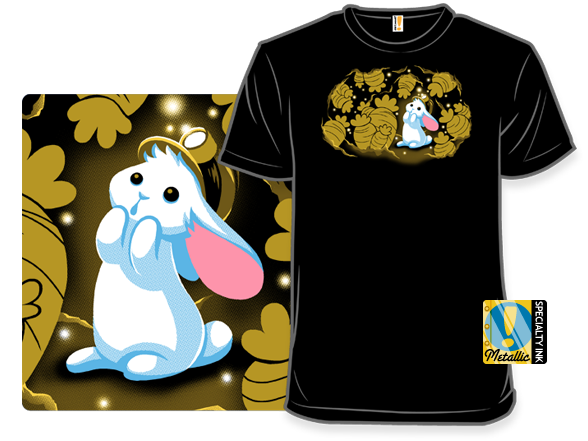 Filed under Animals, Art, Original Art |	Comments Off on 14 Karat Gold shirt on sale! 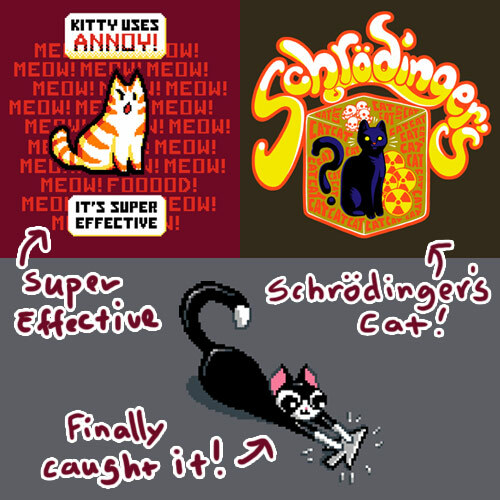 For a limited time only Shirt.Woot.com has put 3 of my cat shirts back up for sale! You have until Sunday 7/8 at midnight if you want to order one. Please check the sizing chart. Woot changed over to a new shirt blank so the sizes, especially the women’s sizes, have changed a lot. Kickstarter Final Days! Sticker Sheet Mockup and Badges! Go to Kickstarter to read update or pledge! Hello everyone! Were into the final stretch with 57 hours to go and right now we’re a little under 8,000! Which means we passed the 5 extra originals added randomly to 5 backers packages at the 20.00 level and above! So I will be pulling names out of a hat and giving away 10 pieces of original art when I package up the packages! Just a note, if you want to receive any of the free backer goodies but you’re at the 1, 5, or 10.00 reward levels and don’t want the physical book, If you raise your pledge up to 20.00 (23.00 for Canada and Mexico and 25.00 for International) but keep the same lower reward. I will add your name into the original give away and also send you the badge/sticker sheets/freebees that all the other backers get. In other news the sticker sheet has been decided: #5 the Popular set won with 26 votes! There was a tie for second place between Knittens and the Caterpillar cat sets at 16 votes but the Popular set quickly took the lead and kept it. So here’s a mockup of the Popular sticker sheet. 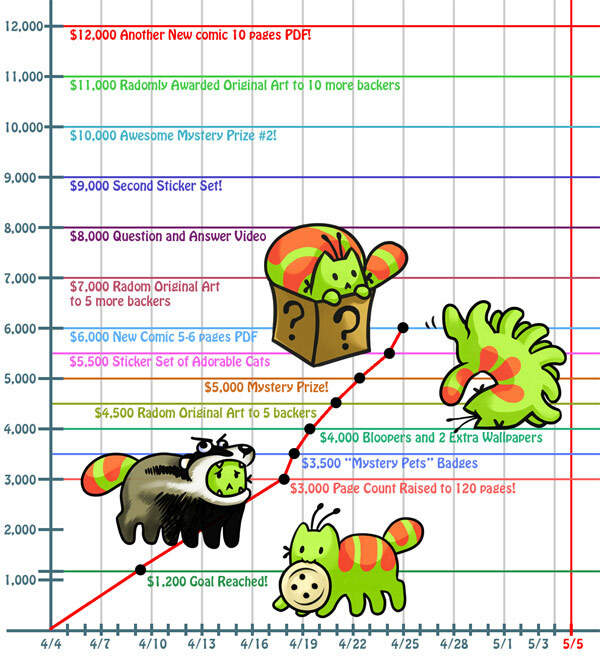 Here are the remaining extra goals as we run up to end of this Kickstarter! Go to Kickstarter to read update or pledge! If we make it to 10,000 I have an Awesome Mystery Prize #2! Which is awesomely mysterious. I will also add double of Mystery Prize #1 which are videos of me making art! Should we somehow hit 11,000 I’ll randomly add 10 more originals into 10 backer’s packages (at the 20.00 level and above). The higher the pledge the more chances you’ll have. I really want it to feel like Christmas when you get your package. And finally if we make it to 12,000 I will make another new comic! This one will be 10 pages long and will be sent as a PDF to all the backers of this project! Thanks again everyone! I’m looking forward to the final stretch of this project please keep spreading the word if you can. Only 57 hours left! 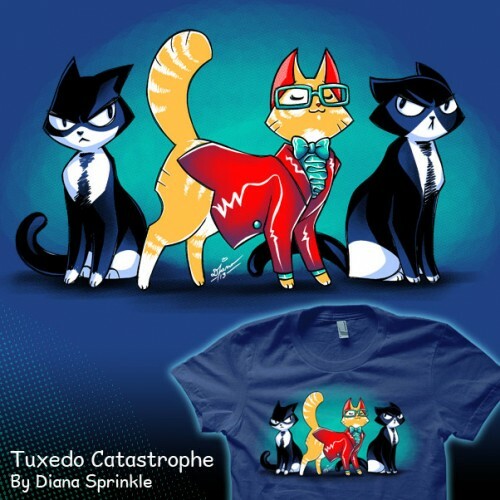 CAT Nouveau shirt is for sale! OMG OMG OMG, My shirt won first in the derby! Does a little dance all over the place! So of course my internet had to die for an hour… grumbles! But loook! It’s up for sale! Friday it’s only 12.00 but tomorrow it’ll be 15.00. Makes excited noises! Oh check the size chart in the yellow box at the bottom of the page before you order! Woot just changed their shirt blanks and the woman’s sizes are not so tiny anymore (the men’s blanks are about the same)… it’s a sad day though for people that fit into tiny shirts. Eeeeee, runs around the room. 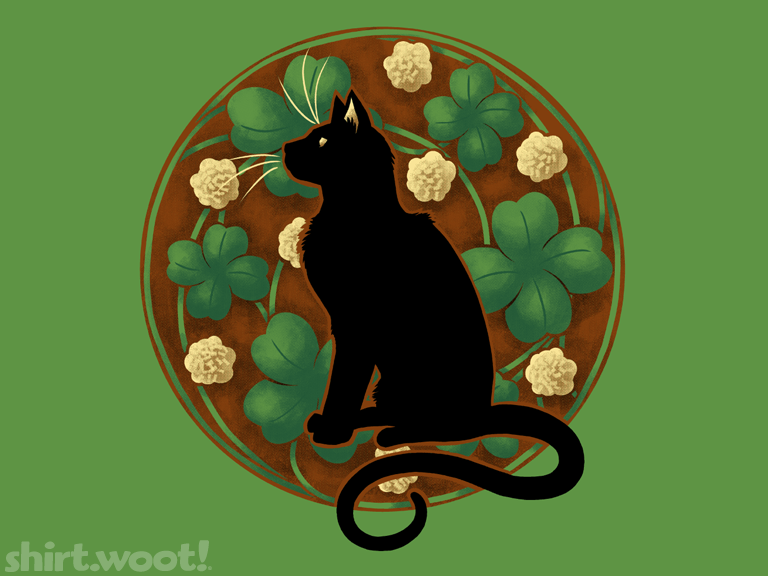 Filed under Animals, Art, Original Art |	Comments Off on CAT Nouveau shirt is for sale! Go to Kickstarter to view the update! 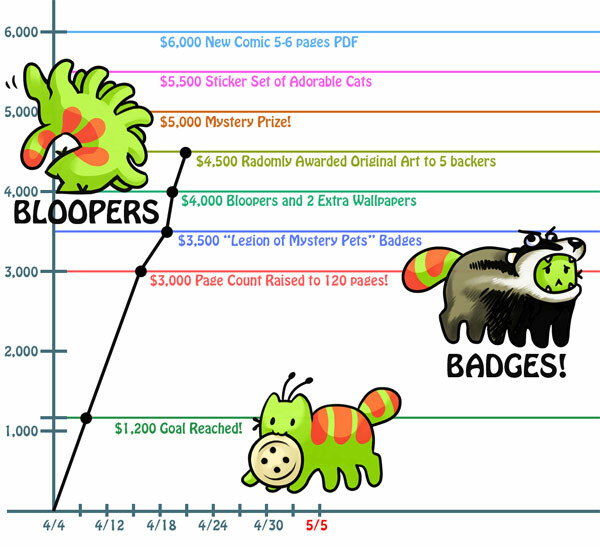 Wooo, we’ve passed the Mystery Prize, the Sticker Set, and the 5-6 page comic levels! You all are so great! Yay! Before revealing the mystery prize here is the design for the free badge that will be included in every pledge 20.00 or over. Thanks so much everyone! I’m so happy that I’m able to add more to the packages. Since we’ve moved past so many goals I’ve made an all new chart with new goals that hopefully we can reach. Doing this Kickstarter has been a really great experience for me and I’m looking forward to including a ton of fun things in the packages. If we hit 7,000 I’ll randomly add 5 more originals into 5 backer’s packages (at the 20.00 level and above). The higher the pledge the more chances you’ll have. At the 9,000 I will include another cute sticker set into all the packages for backers at pledge levels 20.00 and above. If we make it to 10,000 I have an Awesome Mystery Prize #2! Which is awesomely mysterious. I will also add double of Mystery Prize #1 which is revealed below! And now Mystery Prize #1 revealed: Three Videos of my drawing process! Watch me draw! Marvel at my use of many different programs! See how often I can draw something only to erase it all again! The first one is me drawing and coloring the free badge design. You guys will get a peak into my process as I make art. I hope you enjoy these. =D Thanks so much everyone for helping spread the word and getting this project out to so many people. I’m working on the Badges and wallpapers right now. When I have a little free time I’ll add some more goals to the chart encase things keep moving. Thanks again everyone! 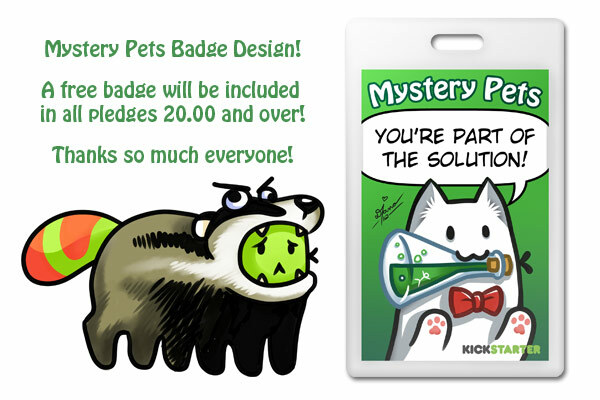 At 5,000 I have a Mystery Prize and all previous prizes, badges and originals, will be available to the 20.00 and above pledge levels instead of the 25.00 levels. 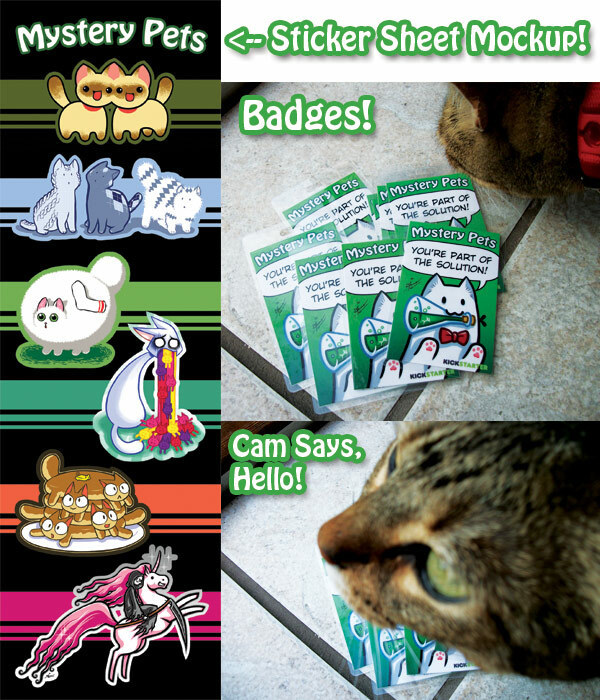 If we hit 5,500 I have a cute sticker set of adorable cats that I will include in every pledge level 20.00 and up. New design for woot’s “Art Nouveau” derby. Just a black cat done in the art nouveau style.